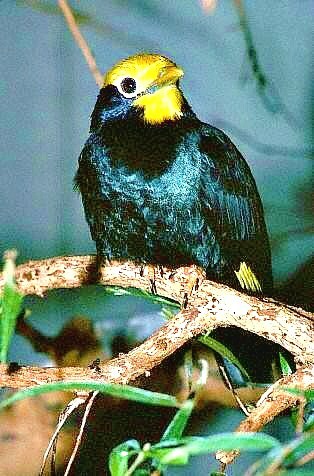 The golden-crested mynah is a smallish starling that can be found throughout a large range in South and Southeast Asia. They have also been introduced to a handful of islands as well. Their preferred habitats lowland, subtropical forests. These birds are very appropriately named-- they have bright yellow crowns on their heads, and darker feathers over the rest of their bodies. Like many other mynahs, the golden-cresteds are able to mimic other sounds. They can even recreate human voices! The word mynah itself actually derives from a Sanskrit word meaning "joyful", which is turn has a root word that means "bubbles". "Bubbling with joy" is a pretty apt description of these active, talkative birds. Golden-crested mynahs are omnivores that feed mostly on fruits and small insects, though they will go after some small vertebrates as well. They live in small flocks, pairs often remain together for several years, and they have a lifespan that can last as long as 20 years. The population of the golden-crested mynah has not been quantified, and is on the decline due to habitat loss and degradation. The decline is slow, however, and the bird remains common in most of its range (though it is more rare on the fringes).